[dropcap size=”4″]O[/dropcap]ne could say that RBHS sports have a knack for reaching high altitudes. Many teams, such as girls tennis, girls golf, cross country and others, consistently reach the state level in their respective sports, and sometimes even bring home a state title. 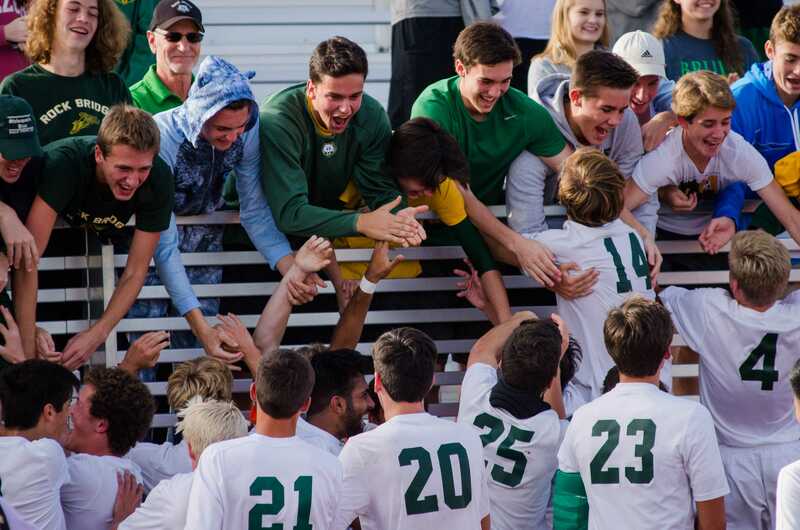 For the soccer team, however, even competing at the state level has been a relatively uncommon thing — until now. Recently, the Bruins’ efforts throughout the regular season and the postseason have landed them in a prime position: the Final Four. The Bruins found success early, but struggled in the middle of the season. Despite entering the postseason with the worst record in the district tournament, RBHS won two overtime games against rivals Hickman and Smith-Cotton High School to capture the district title, including a penalty kick thriller against the latter. The Bruins then defeated Lee’s Summit West (LSW) and Ozark in the sectional and quarterfinal rounds, respectively, to reach the Final Four. Now, the Bruins are looking for a win against nationally-ranked Rockhurst High School in the state semifinal game on Oct. 11. With this in mind, senior midfielder and team captain Drew Stanowski knows how big of a challenge this will be for RBHS. If RBHS defeats Rockhurst, they will advance to the state championship game and face either Christian Brothers College High School (CBC) or Francis Howell North, both extremely talented teams who can give the Bruins fits come game time. In the midst of such competitiveness, however, is an emotional time for the team as well. With the next two games being the final ones for the season, the senior-led team has realized that these are the final moments in which the Bruins, many of which have been playing together for years, will be able to play together for RBHS. Many players, including senior goalkeeper Wilson Fitzgerald, hope to find inspiration within such emotions. With many excited about how the state tournament will play out, Wittenborn remains confident of his team’s passion and talent. Do you believe the team can bring home the title? Let us know in the comments below.